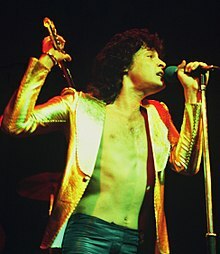 Barry Andrew Hay (born 16 August 1948) is an Indian-born Dutch musician best known as the lead vocalist and frontman for Dutch rock band Golden Earring. Hay was born in Faizabad, India to a Dutch Jewish mother, Sofia Maria née Sluijter (b. 1922 in Makassar), and a Scottish commissioned officer, Philip Aubrey Hay (1923-1980). He moved to the Netherlands at the age of eight to live with his mother. He lived in Amsterdam and later in The Hague, attending an English boarding school. After graduating from secondary school, he took courses at the Royal Academy of Art, The Hague. In the summer of 1967, he joined the Golden Earrings, as they were then called, replacing Frans Krassenburg. Hay created the cover art for some of Golden Earring's albums. He has also made three solo albums. Only Parrots Frogs and Angels (1972) and Victory of Bad Taste (1987) both met with little success. The Big Band Theory (2008) is available as an online stream. In 1994, he sang lead vocals and played alto flute on the Ayreon song "Sail Away to Avalon," the single from the latter's debut album, The Final Experiment. In 2001, Hay left The Hague and moved back to Amsterdam, although he now divides his time between the Netherlands and Curaçao where he hosts a radio-show. During the 2000s Hay provided the Dutch voice of Rock Zilla, in the Gene Simmons' cartoon series My Dad The Rock Star and appeared in a commercial for prescription sunglasses.. In 2016 Hay released an album with side-project Flying V Formation, and his biography. ^ Birchmeier, Jason. "Biography: Barry Hay". Allmusic. Retrieved 16 April 2010. ^ His grandmother, Vrouwtje Sluijter née Polak, and his uncle, Marcus Sluijter, were murdered in the Holocaust.